The women of Cumberland were ever interested in the business and cultural growth of the city, working individually and through church and fraternal organizations for the various projects, but the need of an organization devoted to civic betterment was felt by many and in May of 1909 the Cumberland Civic Club was organized. The meeting is memorable, more than two dozen spirited, energetic women met are the home of Mrs. Max Kamen, Green street and with 28 charter members an organization was formed with the following temporary officers; Mrs. Alexander Thomson, chairman, Mrs. Albert Fowler, secretary; Mrs. Robert Gordon and Miss Alice McMichael to form bylaws and constitution. On June 3 of the same summer the permanent organization was effected with Mrs. Max Kamen as president; other officers were Mrs. J. W. S. Cochrane, Mrs. Lloyd Lowndes, Miss Alice McMichael 1st; 2nd and 3rd vice presidents; Mrs. William Tinker, treasurer; Mrs. Albert Fowler, secretary. The directorate included Mrs. J. W. Averitt, Mrs. Alex. Thomson, Mrs. Thomas Footer, Mrs. A. H. Amick and Mrs. J. J. Wilson, the terms to be from five to one year, respectively. 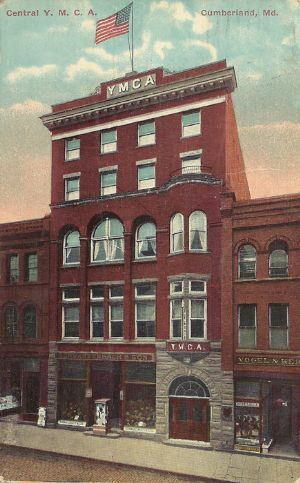 Committees were appointed at this meeting which was held at the Y.M.C. A. with an attendance of more than 100. Mrs. Fowler was named chairman of the humane section; Mrs. Lowndes of the philanthropic section and Mrs. R. Semmes in charge of the child labor section. A committee composed of Mrs. Edward Harris, Sr., Mrs. E. St. George Lough and Mrs. Holmes visited Mayor Kean who promised cooperation in the matter of prevention of cruelty to animals and in welfare projects submitted. Mayor Kean appointed a committee of men to work with the women in securing a pure water supply, a subject uppermost at that time owing to the prevalence of typhoid. A public library was badly needed and promoted. Credit is given Mrs. Kamen for the beginning of a garbage system, which has grown in efficiency. Playgrounds started then are now growing in popularity and considered part of the city's welfare work along with many recent improvements. A tuberculosis section with Mrs. Robert MacDonald as chairman flourished so vigorously that in February of 1913 the tuberculosis hospital was started under the incorporated name of Allegany County Tuberculosis Hospital. For years a member of this club was in charge of tuberculosis seals at holiday time, the proceeds being applied to this cause. In 1914 the Civic section succeeded in having a waiting room opened on South Centre street for the use of passengers on the electric railway. The organization of Travelers Aid Society was another of the many projects carried by or through the assistance of this group of workers. Succeeding Mrs. Kamen, the following women have served for one or more terms of four year: Mrs. J. W. S. Cochrane, Miss Mary McCormick, Mrs. W. W. Hanley (deceased), Miss Elizabeth Lowndes, Mrs. Anna M. McCleave, Mrs. John D. Roberts, Mrs. George Young, Mrs. W. W. Brown, Mrs. F. O. Taylor and Mrs. Harold Smith. In 1925 on Dec. 5 another group of civic minded women organized a club chartered under the name of Cumberland Woman's Club with Mrs. William Claus as president. This club flourished and grew numerically with much outstanding work to its credit, such as caring for the blind and needy through welfare departments, with Mrs. B. O. Fritch and Mrs. Nellie W. Footer succeeding Mrs. Claus as president. In 1932 after much deliberation of groups and with the belief that In union there is strength, the Women’s Club and the Civic Club formed a merger, reorganizing under the name of Woman's Civic Club of Cumberland, electing Mrs. Franklin H. Ankeney as head. The merger proved a success as the combined membership has carried on in the several departments showing an achievement of which its members may well be proud. Notably among the things accomplished may be named the welfare department through its many subdivisions. Assistance to the blind has resulted in the paying of a blind student's schooling fees, and through the sale of basketry and other handiwork helped make the blind workers in the community self supporting. Nearly 27,000 quarts of milk are dispensed to children, hot soup is served to a class of physically handicapped children at Union street school, assistance is given the children of the Day Nursery, needy families are given help, an annual contribution of $200 is given the Welfare Federation. Education, art, music and other cultural pursuits are carried on, the study of gardening, the work of humane section, home economics and other studies have helped further community interests. Mrs. A. N. Golladay is the present head of this group of nearly 200 members- the outgrowth of that early group of 28 determined women in the interest of civic betterment.